The birthday boy, Sweden's Jan Hedstrom. Friday: With harvesting and work being full on, I made use of my one day off by getting up even earlier than a normal weekday but with added zest. The British Open is an event I look forward to more for the social side of the occasion rather than the competition. I�ll admit that I have a poor record and being at Margate this year, which I rate as the toughest challenge on tour, I wasn�t feeling ecstatic about my hopes. I reach the north Kent coast around 8.30am and go for a stroll, checking out a route for a Friday night pub crawl. The Margate area is the home of the micropub and previously, I�ve restricted myself to the ones near the course. Not this year. On my way back to the car, I see Dave who is on his way for breakfast. The weather is utterly spectacular and there no place I would rather be right now except one. I have reached the Sheila utopia. I only play the Strokes course at tournament time so in effect, I have to start over again with learning. With a morning under my belt and with around two thirds of the holes sorted, I have the first of famous sausage and onion baguettes the Matt and his staff do so well. It�s up there with the chocolate pastries I had in Vizela. Goodbye any attempt at a diet. The British Open attracts a number of keen Europeans, all seven of whom are returning to our shores once again. My great friend, Rainer (he of the double bounce out video), greets me with a hug and we chat openly. The afternoon is taken up by the Players Championship, which is a mixture of strokeplay and matchplay. Putting steadily to start with, I have a meltdown on the fifth which places me back in the pack and out of the event. This is something I have to fix for next year. My ranking says second, I don�t play like it at times. The rest of the afternoon, I work on a weakness of mine. Ramps. Margate has a couple of unforgiving slopes at the 3rd and 17th, both of which have cost me in previous years. In a late round with Ed and Pauli, I post a 32. Hey, I make like it here after all. After a brief panic checking into our guest house, where the hosts are absent but with the help of an email from nearly two years ago, I obtain a number number, myself and Ed get ready for a night out. We�ve arranged to meet Pauli by the station and we bump into the Donnelly�s too. We have a view across the harbour as the sun sets. I�ve forgotten about anything else going on in my life temporarily. Minigolf does that for me. I guess anyone who takes part in an activity where they become weekend warriors of sport can relate. I take Ed on a partial tour of the nightlife, it would have been a full tour but we liked the music and barmaid in The Lifeboat. Today has been a good day. I have two more left too. Saturday: Even with the curtains drawn, we could feel the strength of the sun outside. It�s British Open day. With my relatively new role on the executive committee, I am keen to show willing. I�ve been working on a computerised voice introduction system for players to be called to the tee. I�ve trialled it at home but I�m a little nervous about it. I shouldn�t have been. It went just swell. My day one partners are the Planet Hastings duo of Ted and Helen. Round one starts well, as I get to two under through seven. The eighth, which I played excellently the day before, becomes a nemesis. I rarely play for the pipe and after finally getting through on the sixth attempt, I�ve made my first error of the day. My efforts to recover the situation are fraught. A huge lip out on the ninth. A second shot on the tenth from which I had never played from. I ace the last but the damage is done with a 41. Feeling determined my start won�t get me down, I�m confident I can sort this out during the day. My very next lane is a disaster. I take four, the only one all weekend. I can�t even figure out how that happened. I know I�ve got to get my concentration back but I�m finding it exceptionally difficult. I�ve documented my situation over the past six months and a few stray shots means I want to be at the other place I would rather be. There are times where I can�t get off the course quick enough. On the bright side, at least I know it isn�t anxiety. The final round of the day is probably my best performance, without the success. It�s been a mixed day. At least the food was good. As the last groups complete their rounds, I�m in the competition hut with Scott and Ted, organising the day two pairings. Ed meets up with an old friend, so this allows me to head back to the room to get some rest. Playing and organising is a full-on day. Personally, I enjoy being involved this way. I�ve always been a person who isn�t very good at standing still so this fits right in. Do I think it affects me taking on both roles? I don�t know yet. I need some more tournaments under my wing first. The evening entertainment is provided at the Ali Raj emporium of curry. Half the field are there. On the next table, that group are singing happy birthday to one of their party. 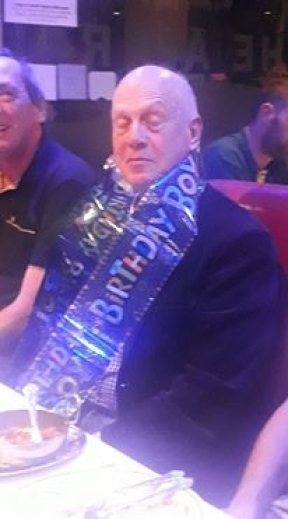 We�re in luck that one of our party, Jan Hedstrom, is celebrating too so we acquire the decorative banner and drape it over his shoulders. By the end of the evening, which shall be forever known as �fun with acronyms�, we grab a beer in the Ales Of The Unexpected, taking Terry�s money from him in a dice game. It ended on a high. Sunday: I�m up before the alarm but so is Ed. I turn on the television, hoping to catch the football from the previous day. As luck would have it, there seemed to be a Peppa Pig marathon on. I�ve now seen the show, eaten the cast. My plan for the day is to get inside the cut line, which myself and Martin figure out how to put onto Bangolf. The second day brings David and Matt into my group. I start well but with the exceptionally tricky middle section giving me a headache, I flounder and flatter to deceive. My one ray of sunshine is the ramp hole at the 17th, which I manage to ace for the second time. The highlight of the round, no, the competition, is David Hartley standing over his putt having to back off as he is disturbed by the sound of snoring from Martyn�s three month old Jack Russell puppy. I�m not sure how something that small could create that much noise. Round six was a car crash of a start, taking a four at the fourth and a six at the fifth. I have absolutely no explanation for this, Matt tries his best to reassure me. From there, I hit my best streak of the weekend, going clean for the remainder of the round and picking up three shots. 39 represents a decent recovery, which puts me four off the cut. Anything is possible at Margate, as my scoring proves. All I need is to carry on the successes of the last round with a touch of fortune. For once, I�m putting well but with no reward. Frustration creeps in. As I open with a 41, so I close with the same and my 2018 assault on the British Open meekly crawls under the rock it came from. I can now concentrate on food. Adrian resurrects the hole in one charity challenge, which is a welcome returnee to the tour. We raise �25 for a local concern. The super final groups go out, which allows me to do the introductions myself. Once I call the last group, I Facebook live as much as I can. The Strokes course is reasonably good for viewing and on more than one occasion, I can capture two shots in one screen. I follow the lead group of Karsten, Daniel and Michael for the most part. The Czech does have a chance to capture the title and the Open swings on two key moments. Michael makes the pipe hole by the finest of margins, we�re talking millimetres. Coming to Heartbreak Ridge, Daniel takes a four and Michael makes his par. From there, it�s a procession as Michael wins for the fifth time. As I�m attending the next event, my car gets loaded for all the equipment required to run it. This reminds me of my days as a self-employed entertainer. The journey home is dreadful, which culminates in a lorry driver trying to get into the car zone in a service stop. I�m exhausted from it all. It�s been a wonderful time. I�m so grateful to everyone�s kind comments about how the competition was organised. I didn�t get into the organisation for the appreciation, I always felt I had something to give the tour. I�m glad you like what we�re trying to do. Thank you.